Welcome to the official homepage of BattleSphere, a 3D networked space battle game for the Jaguar and possibly other platforms. After 6 years' struggle with bad documentation, worse tech support, corporate buyouts, the headache of the Jaguar's encryption, the short supply and painful expense of cartridge components, and some rather vocal nay-sayers, we have at last manufactured the game! We also walked to school uphill in the snow both ways, if you must know. Just as a reminder, we're contributing all of our after-tax profits from BattleSphere to diabetes research! 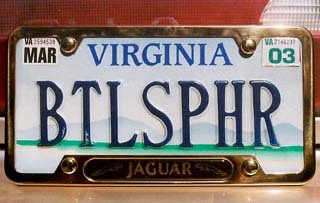 BattleSphere Fan Randy Femrite shows he is very enthusiastic about BattleSphere!